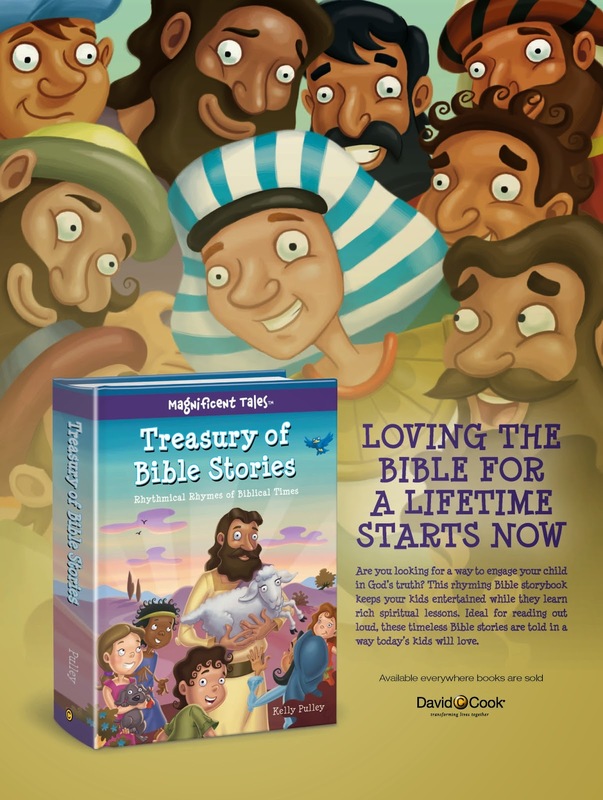 This book is a collection of illustrated rhyming bible stories for young readers. It contains twenty stories, beginning with "Tricked by a Snake: The Slippery Story of Adam and Eve" and ending with "He Has Risen: The Magnificent Story of the Resurrection". I promise he does look at the book when we read it to him....it's just when the camera is out he has to smile for it! Lol. My Review: As a new mom, I'm always on the look out for books that will cultivate a love of God and reading. This is the perfect one! The artwork in this book is amazing. So colorful and engaging, the pictures will draw your child right in. I was surprised at how well thought out and executed the rhymes were...they are fun and tell the stories perfectly. This is a great way to share biblical lessons with the whole family! My husband, who most of the time could care less about the different reviews I have going on, said, "Make sure you give this book a great review!" We both have really enjoyed reading this book to Little E. I know it will be a favorite for years to come. I would read this to my son and daughter! I would read them with my nieces! I would enjoy reading these bible stories with my three young children! I would enjoy reading this book with the children in my Sunday School class. I'd love to read them with my 4-year-old niece! My grandson would be the one to receive this. I know he would enjoy it. I would read this with my daughter! I would read this with my 2 boys. My two year old son would love this! I would enjoy reading these stories with my children. My youngest two children would enjoy reading this book with me! I'd read this with my little girl and eventually my baby boy. My 3 little grandchildren would love to have this read to them, their dad reads to them from the bible every night. I would love to read these bible stories to my grandchildren. Who would I enjoy reading Treasury of Bible Stories to? My grand daughter. She loves to be read to. What book to read to her than this one. I would enjoy reading the Treasury of Bible Stories with my 6 year old daughter. I would enjoy reading The Treasury of Bible Stories to my 2 year old daughter & my 9 year old son. I would read this with my little grandsons. If I won, I would read this with our granddaughter. I would love to read this to my 3 kids. Thanks for the chance!